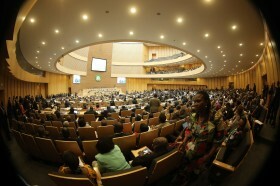 Today during the official opening of the African Union Summit of heads of state, H.E. Armando Guebuza, President of Mozambique, conferred the 2014 African Leaders Malaria Alliance (ALMA) Awards for Excellence in Vector Control to Cape Verde, Madagascar, Malawi, Namibia, Rwanda, Sa?o Tome? and Pri?ncipe, and Swaziland. Each country has demonstrated exemplary leadership in maintaining at least 95% coverage year round of Long-Lasting Insecticidal Nets (LLIN) and/or Indoor Residual Spraying (IRS) interventions, the most important tools in preventing malaria. 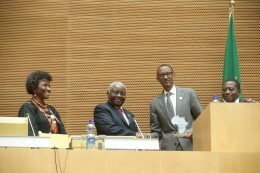 At AU Summit, Rwanda President H.E. Paul Kagame Accepts ALMA Award for Excellence in Vector Control. Seven Countries Won in 2014. Last month, the World Malaria Report declared that as a result of significant scaling-up of malaria control interventions, an estimated 3.1 million lives have been saved in Africa since 2000, reducing malaria mortality rates by 49%. And while funding challenges remain, resources for malaria prevention globally have grown from USD $100 million in 2000 to an estimated USD $1.9 billion in 2013. ALMA’s current Chair, H. E. President Guebuza of Mozambique, has rallied his peers and partners to increase malaria funding so that we sustain these impressive gains. ALMA was founded by H.E. President Jakaya Kikwete of the United Republic of Tanzania to create a platform for Africa’s presidents and prime ministers to accelerate action on malaria prevention and control. ALMA’s second chair, H.E. President Ellen Sirleaf of Liberia, continued to promote performance and accountability through the innovative ALMA Scorecard for Accountability and Action. Winners of ALMA’s Awards for Excellence are selected by an independent committee representing the World Health Organization (WHO), Roll Back Malaria (RBM), the private sector, civil society and academia. For more information about ALMA and for a profile of the progress shown by the seven winning countries, please visit www.alma2015.org.